Why should we celebrate Mother Goose Day? For me, Mother Goose is synonymous with nursery rhymes, and they are some of the earliest texts we read, sing and chant with kids. That means they’re a powerful tool in the parenting box of tricks. Our little ones are exposed to all the wonders of language in a playful way with Mother Goose and other simple rhymes: to the rhythms of poetic language, to rhyming words, to very simple story sequences, to sound patterns, and, frankly, to some wild and wacky situations that provide fuel for young imaginations! With repeated readings of nursery rhymes, our kids begin to memorise them, and that helps them tie print to memorised words as they move towards real reading. Many of the rhymes common to children in English-speaking countries have been set to music, and this has a big benefit for memorisation and ear training. Above all, Mother Goose and other rhymes are fun, a way for our children to entertain themselves and enjoy rhymes that have been handed down through the generations. But Mother Goose rhymes are not just rich sources of learning for young children. Older kids can benefit from studies with such a focus too. Imagine the learning involved in researching rhymes across different cultures! Because many children have grown up with a common core of rhymes, they make excellent fodder for drama games and improvisations. Students can innovate on nursery rhymes to create new ones. And nursery rhymes make a great way to look at history and the way people lived in the past. 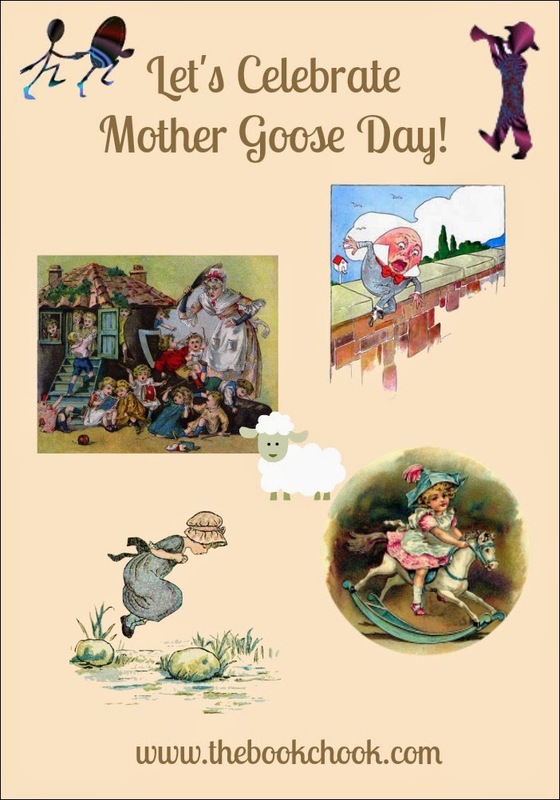 Mother Goose Day is traditionally celebrated on May 1, but like all Book-related Special Days, any day is a fine time to celebrate and share the fun! * Mother Goose’s Nursery Rhymes on Prjoect Gutenberg. * This is the Mother Goose version illustrated by Kate Greenaway. * Here is Denslow’s Mother Goose. All of the above are free of copyright, so primary/elementary aged kids could use the illustrations and text to create their own new works. How many original Mother Goose rhymes do we and our kids know? There are many more on the original books than I’d ever heard of, so I hope you’ll take a look, recite and discuss them with your kids. It’s fascinating to explore meanings or just wonder what people were thinking! Here’s one for your kids from The Real Mother Goose that’s guaranteed to get them laughing. Tell the kids it’s their job to say the second, fourth, sixth lines and so on, while you say the first, third etc. If they don’t understand immediately, have them repeat the last line LOUDLY! Looking at the illustrations for the different Mother Goose rhyme versions is interesting. I love the vintage style, and I think some kids will really respond too. What insight does it give children into clothing, pastimes, occupations and toys of those days? If you have an iPad, check out my review of the app, Felt Board - Mother Goose on the Loose. There are lots of resources at www.mothergoose.com including crafts and pages to colour, lovely antique clip art to download for free, and videos. The BBC has excellent little videos with lots of rhymes put to music and animation. At Hubbard’s Cupboard, you’ll find printables for hands-on activities, designed for a Family Math and Literacy Night. Mama Lisa's World is a great resource for all sorts of rhymes and songs from all over the world. Bookstore UK has some nice downloadable rhyme time sheets. Twinkl has excellent nursery rhyme resources. Enchanted Learning has Nursery Rhymes Rebus Rhymes. At PreKinders, you’ll find some great printables - black and white nursery rhyme posters and colour matching cards. Check out my review of the Mother Goose felt board app, Mother Goose On the Loose. Red Ted Art has lots of crafts for nursery and other rhymes. If you're interested in using chants and rhymes with kids, you might like to read Let's Celebrate Pop Goes the Weasel Day and Let's Use Chants and Rhymes with Kids. Or download a free printable copy of my PDF, Literacy in the Playground. You 'll find other special bookish days for celebrating in A List of Book-related Special Days.